Only on our online parts store you will find about 1 million John Deere Construction parts for, as well as John Deere Agricultural parts for agricultural machinery. Backhoes - 310L, 310L EP, 310SL, 310SL HL, 315SL, 410L, 710L. John Deere Compact Track Loaders as 317G, 325G, 331G, 333G. John Deere Crawler Loaders such models as 605K, 655K, and 755K. 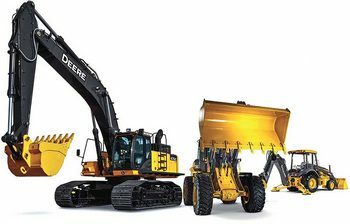 Large John Deere Excavators - 470G LC, 670G LC, 870G LC. John Deere Motor Graders models as 620G/GP, 622G/GP, 670G/GP, 672G/GP, 770G/GP, 772G/GP, 870G/GP, 872G/GP. Skid Steers as 312GR, 314G, 316GR, 318G, 320G, 324G, 330G, 332G. Compact Wheel Loaders like 204L, 244K-II, 304L, 324K and 344L. Mid-Size Wheel Loaders: 444K, 524K-II, 544K-II, 624K-II, 644K, 644K Hybrid Wheel Loader and 724K. Construction Attachments: Augers & Trenchers, Backhoes, Blades & Scrapers, Shredders & Mulchers, Forks & Spears Grapples, Hammers, Planers, Rakes & Tillers, Rollers, Snow Attachments, Steel Tracks. Contact us or find your John Deere parts online.